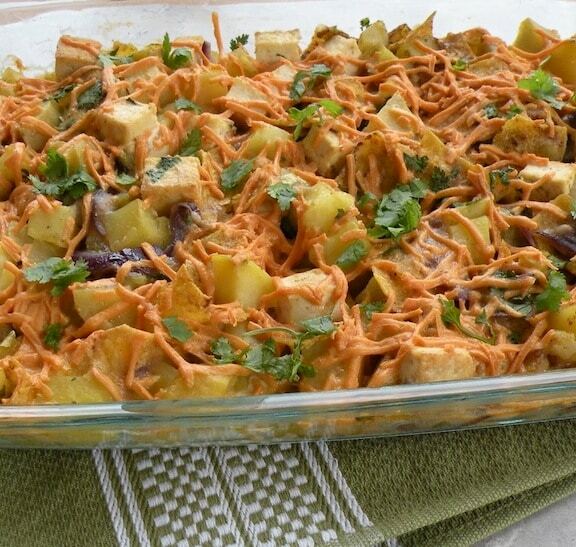 Here’s a casserole of potatoes and tofu, laced with green chilies —hot or mild, as you prefer. Both comforting and invigorating, this is good served with refried beans or other simple bean dish, and a colorful salad. Cook, bake, or microwave the potatoes in their skins. When cool enough to handle, peel and dice them, then transfer to a large mixing bowl and set aside. Heat the oil in a large skillet. Add the diced tofu and cook over medium-high heat, stirring frequently, until the pieces are lightly golden on most sides. Transfer to the mixing bowl. In the same skillet, heat the olive oil. Add the onion and garlic and sauté until the onion is lightly browned. Stir in the chilies and seasonings. Sprinkle in the flour and stir until it dissolves. Pour in the rice milk and stir together. Simmer until the liquid thickens. 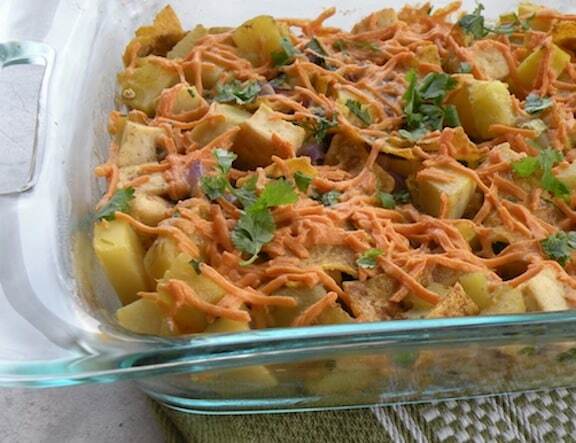 Combine the skillet mixture with the potatoes and tofu. Stir together, then season with salt and pepper. Pour into a lightly oiled large shallow baking dish. Sprinkle with the grated cheese. Bake for 20 to 25 minutes, or until the cheese is melted and the casserole starts to become golden brown along the edges. Let the casserole stand for 5 minutes, then serve.